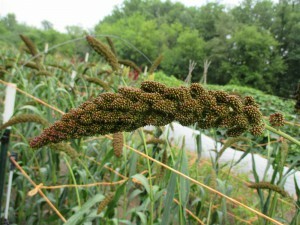 Hell’s Canyon is a foxtail millet (or finger millet) which is grown as an animal feed/ forage crop or for human consumption. 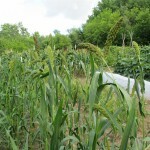 The plants are quite ornamental and produce a fair amount of biomass for the compost pile. The 5′ tall plants are quite productive. Hell’s Canyon is difficult to dehull for human consumption. I have had some success using my hand-crank rice dehuller. There is another method where the dry grain is slightly wetted, and then put into a food processor and pulsed a few times to loosen the hulls, then winnow the grain in front of a fan. I have included info at the bottom of this page on de-hulling options. 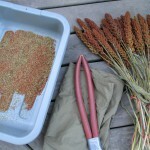 I direct seeded my plants the last week of May and harvested my first cutting of seed heads on September 1st. 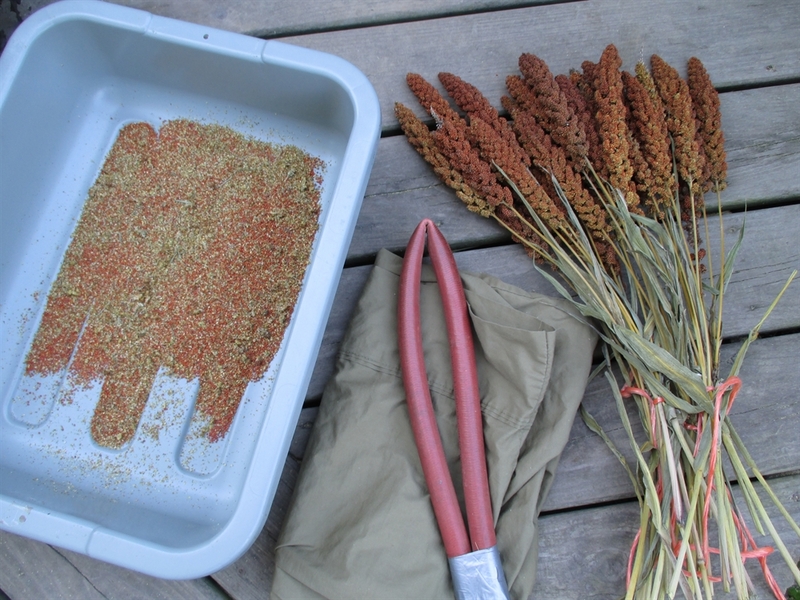 I hang the seed heads to dry a couple of weeks before threshing and winnowing. 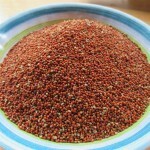 The seed should be planted 1/4” to 1/2” deep in rows or beds. Space 6” to 1′ foot apart. I tie up my plants with posts and twine around the bed to deter lodging. Birds can be a nuisance and I cover my beds with bird netting. This would probably not be necessary for a large plot. 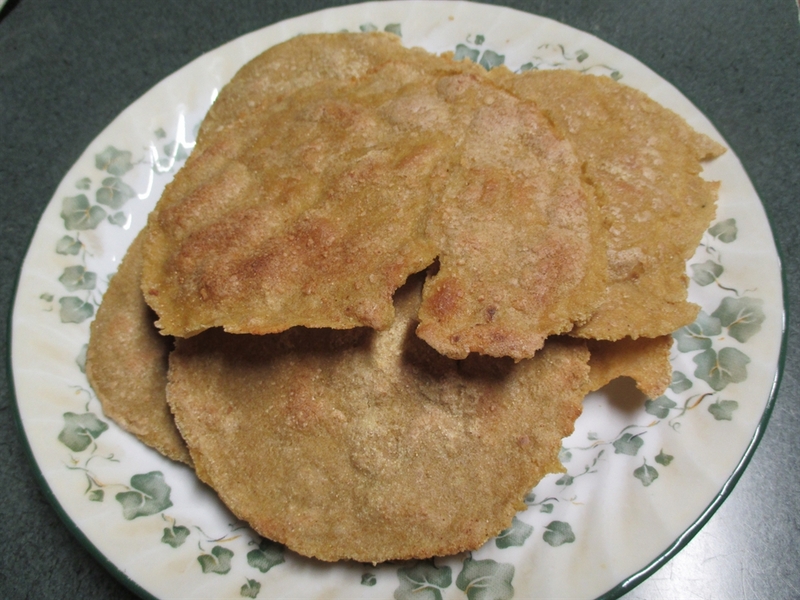 *Here is a wonderful and simple recipe to make Roti (Indian Flat Bread). 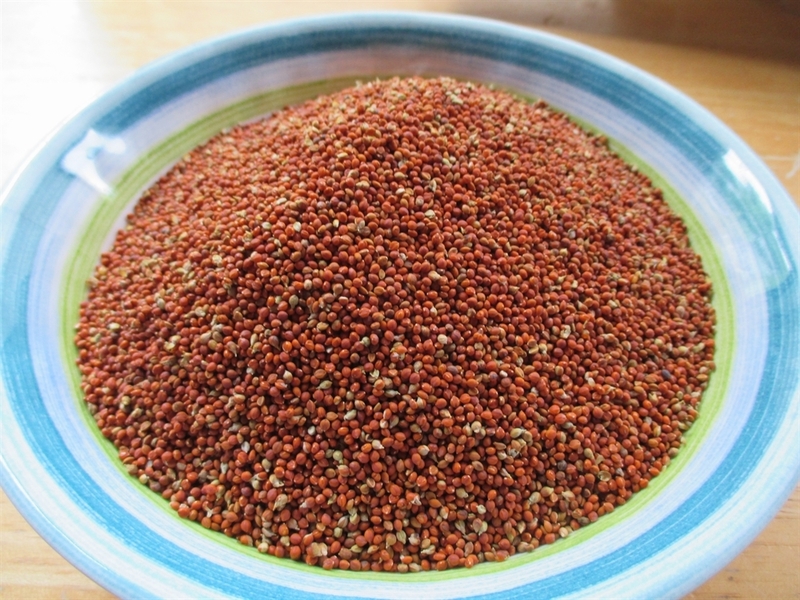 The recipe calls for Ragi (finger millet), but I used Hell’s Canyon. It was very delicious and incredibly easy to make.